iForex review - Scam? Mobile? Demo account? Read more. iForex is a collection of international forex and CFD brokers that was launched in 1996 by a group of bankers and experienced forex traders from all over the world. Today, the main broker is often referred to as just iForex, and in Europe, the service is registered as iCFD Limited. In this iForex review, we will take a close look and the popular forex product, their demo account, what assets they offer and much more. If you have traded with iForex and you have something to say about them, we hope you leave a user review. Let’s get started with the iForex review. If you are looking for a really good Forex solution, then iForex might just be the right broker for you. They offer a really good product and trading platform, and they are of course regulated and licensed to offer their services. They are quite specialized on Forex trading, so if you are looking for forex broker then this is the perfect option for you. 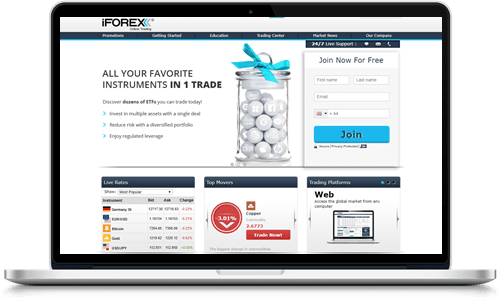 We usually recommend that you sign up with a free demo account and test the platform, however, iForex offers no demo account right now. This is a shame. If you want to try iForex you will have to make a deposit. No, iForex is not a scam of that we are sure. As soon as you see past the somewhat outdated website and actually start to look at the product they offer, it becomes clear that iForex is as serious as most brokers. They also seem to have a good reputation among past clients which is always a great sign. In addition, iForex is licensed and regulated by the Cyprus Securities and Exchange Commission (CySEC) and that is all we need know to determine whether or not we can trust a broker. CySEC only approves the best of the best and will reject their license as soon as a broker breaks any regulations. When it comes to platforms, iForex has decided to keep things as simple as possible which is nice for a change. Many times, brokers try to accommodate as many traders as possible with a long list of trading platforms and analytic tools. Unfortunately, most brokers fail, and instead of offering a good and comprehensive product, it becomes confusing and messy. Because of this, we really like that iForex focuses on simplicity and quick execution. When trading with iForex you have two choices. You can either use the iForex web trader directly in your web browser or you can download the iForex trading app to your smartphone or tablet. Both versions of the trading platform have all the tools you need to analyze the available markets, and you can open and close positions with just a few clicks. Due to the simplicity of the platforms, experienced traders might find themselves feeling a bit limited, and we generally think that iForex is best suited for beginners to mid-level traders. In addition to the platform, iForex provides a detailed economic calendar, a market analysis, real-time charting tools, and practical trading signals that can be arranged for your specific needs. For the sake of even more simplicity, iForex only offers one trading account for all traders. That means that you can sign up and start trading without having to compare the benefits of different accounts, etc. However, it also seems like there is no iForex demo account which we think is a real shame. To us and many other traders, demo accounts are extremely useful tools that we use to plan strategies and test new investment techniques. Demo accounts are also highly valuable to beginners that need practice. iForex offers roughly 200 different assets spread out over six of the most popular assets classes. Forex is the main class as the broker’s name suggests. Commodities such as oil, gold, and silver are also available on the platform. Stocks are the largest set of assets after forex, and you can invest in some of the world’s largest companies. Indices are another popular asset class with their unique set of benefits. Exchange-traded funds are not as commonly offered as other assets, but we like ETFs and encourage you to give them a try. Cryptocurrencies are the latest addition to the iForex selection. You can trade Bitcoin, Ethereum, Ripple, and Litecoin on their own or as currency pairs with USD, EUR, and JPY. As mentioned, iForex is a fully licensed and regulated broker. In fact, iForex has three different licenses which are quite impressive, although we only care about one of them since it’s the most important in the world. iForex is licensed by the Cyprus Securities and Exchange Commission (CySEC) under the named iCFD Limited. In addition to the CySEC license, iForex has been authorized by the government of the British Virgin Islands and by the national bank of Hungary. You have a few options to pick from when it is time to fund your iForex trading account. Besides typical payment methods such as debit cards, credit cards, and wire transfers, you can also utilize the online payment services Neteller, Skrill, and WebMoney. iForex is best suited for beginners and hobby traders and not for the professional day trader.